By Allan Fox: Adrien ‘The Problem’ Broner (33-3-1, 24 KOs) says he doesn’t mind being viewed as a tuneup opponent for WBA World welterweight champion Manny ‘Pacman’ Pacquiao (60-7-2, 39 KOs) to get ready for his rematch with Floyd ‘Money’ Mayweather Jr. (50-0, 27 KOs) in September. Of particular concern is whether the 40-year-old Pacquiao still has enough left in his reservoir to defeat the 29-year-old Broner in order to get to a rematch with Mayweather. Pacquiao is older, and he’s facing a much younger fighter Broner, that is motivated to beat him, and be the one to take advantage of the big fight opportunities that will spring from that win. “It’s alright. It’s okay,” Broner said when asked about his thoughts on being perceived as Pacquiao’s tuneup opponent for a possible rematch against Floyd Mayweather Jr. in September of this year. “He reminds me of Pacquiao just like I don’t remind him of nobody. He ain’t never fought nobody like me. Every fighter has similarities. Every fighter goes into the ring to throw a jab. Every fighter goes into the ring to win,” Broner said. The good thing about this fight is Broner now realizes how different he needs to fight from the way he’s been fighting in recent years. The criticism that Broner has received from boxing fans has enough to where he knows he’s got to throw more punches. His trainer has obviously let Broner know that he’s not going to beat Pacquiao if he doesn’t let his hands go. For that reason, Broner is going to be a different fighter on Saturday night than the one that we saw in his last three matches against Jessie Vargas, Mikey Garcia and Adrian Granados. Broner shouldn’t get things twisted. Mayweather didn’t entirely dominate Pacquiao in their fight in 2015. Even with Pacquiao fighting with an injured right shoulder, which he came into the fight with, he was still giving Mayweather a lot of problems in the first six rounds. Mayweather’s father Floyd Mayweather Sr. had to give him a pep talk in the corner halfway through the fight to motivate him enough to turn up the heat on Pacquiao in the second half of the fight. It worked well for Mayweather, but only because his hand speed, fast twitch reflexes, and excellent defensive skills enabled him to control the last six rounds of the fight. Broner isn’t as fast as Mayweather, and he doesn’t possess his defensive skills. The way Mayweather got the better of Pacquiao, Broner isn’t likely going to be able to do the same things. Broner fights in a similar way as Mayweather, but he’s much slower and he’s not as skilled defensively. Further, Broner doesn’t possess the mobility of Mayweather. Even now, with Mayweather about to turn 42, he’s still faster on his feet than Broner. In other words, Broner cannot be what Mayweather was against Pacquiao in 2015. Broner is a different fighter, who will need to try his best with what he has. He’ll never be Mayweather. “I don’t think I’ll be surprised. I don’t be the first time he’s gone to sleep,” Broner said about Pacquiao when asked what his thoughts would be if he knocks him out. “If a knockout presents itself, I’m taking it. It’ just my time. We’re both punchers, and we’re both fighters that like to fight,” Broner said. It won’t be surprising to the boxing public if Broner KOs Pacquiao on Saturday night. Pacquiao looked good in his last fight in beating 36-year-old Lucas Matthysse, but that match took place against an older fighter in Malaysia. In Pacquiao’s previous fight against Jeff Horn, he fought like an old man in losing by a 12 round unanimous decision. Boxing fans say that Pacquiao was robbed by the judges in that fight. That’s not the case. Pacquiao lost because he didn’t posses the energy to attack Horn in the championship rounds after hurting him in round nine. Pacquiao’s trainer Freddie Roach wanted him to go after Horn to finish him off in round 10, but he couldn’t do it. Pacquiao was gassed out, and he failed to fight hard in rounds 10, 11 and 12. Horn wanted it more, and showed more youthful energy in the championship rounds to pull out a close decision. Broner has youthful energy as well, and he could beat Pacquiao just based on being the busier fighter. Broner might not have been able to beat a prime version of Pacquiao, but he won’t be facing a prime version on Saturday night. Broner will be fighting the 40-year-old Pacquiao, who holds a second job as a senator in the Philippines. With Pacquiao treating boxing as a part-time job, this fight has the makings of an upset on Saturday. It won’t be a surprise if Broner beats Pacquiao, because he has a lot of things in his favor. Ellerbe might be right. Broner could take Pacquiao’s title, and he might knock him out in doing so. It won’t be the first time that Pacquiao has been knocked out. Juan Manuel Marquez did it in 2012 in stopping Manny with a right hand to the head in round six. Broner is every bit as powerful as Marquez. The only thing Broner needs to do is make sure he times Pacquiao well to hit him when he comes forward to throw his left hands, which he loves to do. 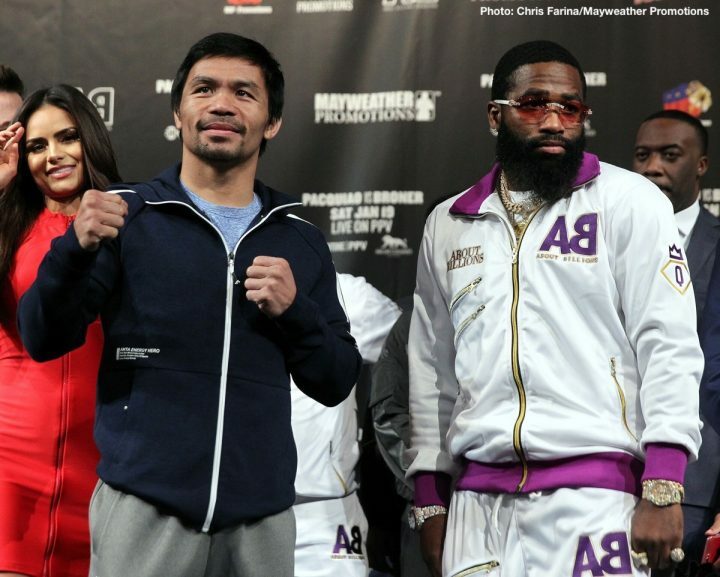 If Broner beats Pacquiao, it could be him that faces Mayweather in September. That would be a huge fight between Mayweather and Broner. It would be a match-up between two fighters with a similar fighting style. Broner was seen as the replacement for Mayweather by a lot of boxing fans six years ago, but things haven’t worked out for Adrien since his loss to Marcos Maidana.